Aside from the potluck dinners – and sometimes in conjunction with them – we also host regular game nights at our house. We invite some people over, pull out a few board or card games, and sit around socializing and playing games for several hours. We usually serve food and beverages at our game nights, usually consisting of either a potluck dinner or a snack buffet. In either case, we simply ask our guests to bring something that goes along with what’s being served. The centerpiece of the evening, though, is the games, which usually go hand-in-hand with a lot of socializing, conversation, and laughs. It’s important to remember that there is very little up-front investment needed to pull this off. My parents, for example, often hosted game evenings when I was a child. After the food was finished, they’d pull out a couple decks of playing cards and split into two or three tables of four people playing cards. (If there wasn’t an even number, the people sitting out would rotate in to replace someone who lost.) These evenings would go on late into the night and involve lots of socializing and laughter. I highly recommend starting off with some card games or with the games you already have on hand, as that will ensure some wonderful cheap entertainment. – Pitch is the game my parents usually played on their game nights. It’s a nice, simple trick-taking game. – 500 is the game my in-laws typically play when they play games for a social event. – Spoons and Dutch blitz are among the really fast-paced games that I enjoy with playing cards. 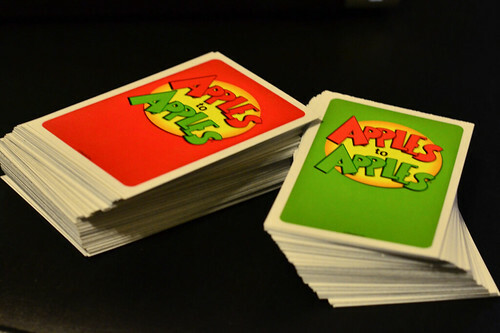 – My favorite game of all, though, is contract bridge. At our game nights today, we usually play board games and card games from the collection Sarah and I have built. The vast majority of these games have come into our possession as the result of gifts received, thrift sales, and trading, so the cost of acquiring them was quite low. There are many excellent games out there. For a nice, social game night, I’d look for games that involve some decision-making, but not the brain-burning amount that games like chess will bring (which is why I often advocate card games, as they’re pretty much perfect). I’d also avoid games that can become overly long or can vary widely in length, like Monopoly or Risk. Our most-played game on game nights is probably Ticket to Ride. In any case, game nights are really just an excuse to spend an evening with friends gathered together socializing without spending much money at all. That’s a wonderful evening in my eyes.